Sleeping on a carefully chosen bed that provides you with the right levels of comfort and support is essential to waking up feeling relaxed, refreshed and ready for the day ahead. A good quality spring interior mattress with the correct bed base can provide excellent posture support and exceptional comfort levels. Open Coil Spring interior beds are the most popular type in the UK and Ireland today. The most widely used type is the Bonnell spring or open coil spring bed. Open coil springs are arranged in rows connected to each other via a spiral helical wire. These are strengthened and held in tension through an outer perimeter rod which also helps to retain its shape. Respa's renowned Open Spring Design System is found in some of its best-selling and great value for money bed ranges. The number of springs used in an open coil bed varies, but a typical 5’ bed contains in the region of 325, or more for higher quality beds. The level of support offered by an Open Coil bed is also dependent on the gauge (thickness) of the wire with 12.5 providing firm support. Balmoral’s range of open coil beds offer differing wire gauges to provide soft, medium or firm feel and come with the added reassurance of a 1 Year Guarantee. Somewhat different from an Open Coil spring, a Continuous Spring bed involves smaller coils and the gauge of wires is usually lighter. This higher spring count is usually formed from a single length of wire and the bed springs are linked vertically as opposed to horizontally. 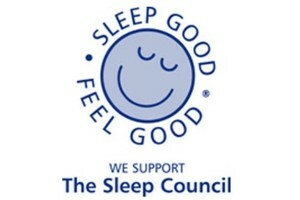 Sleeptight’s collection of great value beds includes the popular open coil sleep solutions. This use of open coil springs is evident in the Sleeptight Bronze, Regatta, Regatta Memory and Regatta Pillow-Top Divan Bed. Continuous Springs are sometimes called Mira Coils by some manufacturers and are considered an entry level bed. As a general rule these beds use a lighter gauge of wire than open coil models which will usually mean a reduced level of support. When you buy at Dalzell's your new Open Spring Divan bed comes complete with Free Pillows, Free Delivery and Recycling Service across Northern Ireland and Counties Louth, Monaghan and Dublin. We’ll also Remove & Dispose of Packaging and set up your new divan bed and mattress in a room of your choice. With additional discounts for Multibuy, and our Price Promise, you can be sure you're getting a great deal because we appreciate your business! Ideally located in Markethill, close to both Newry and Armagh, Call, Email or Visit Us In-store. Competitive delivery rates throughout the rest of Ireland.